Last month my son turned eight, which came as a complete shock. At his wellness visit, the doctor pronounced Zane to be over tall and underweight for his age. 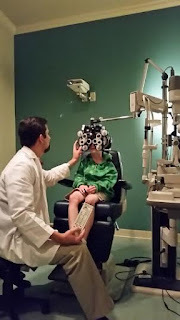 During the routine vision screen, however, my son could not read the letters on the wall. He faked it and read them as numbers, a dead giveaway. My child can't see, I learned, which certainly explained a great deal about his grades. Off to the pediatric ophthalmologist. we went. It was all "look over here", "look over there" to the boy, who wanted an eye patch in the worst way. No eye patch, but a prescription for glasses. Zane can finally see what he's been missing! Go visit Kat Bouska and her Writer's Workshop I used two prompts today! 2.) Write a post in just 10 lines. 3.) Tell us about something new you learned last month. My daughter started wearing glasses at age eight. It changed her world! Both my kids got glasses this year. It really makes a difference.